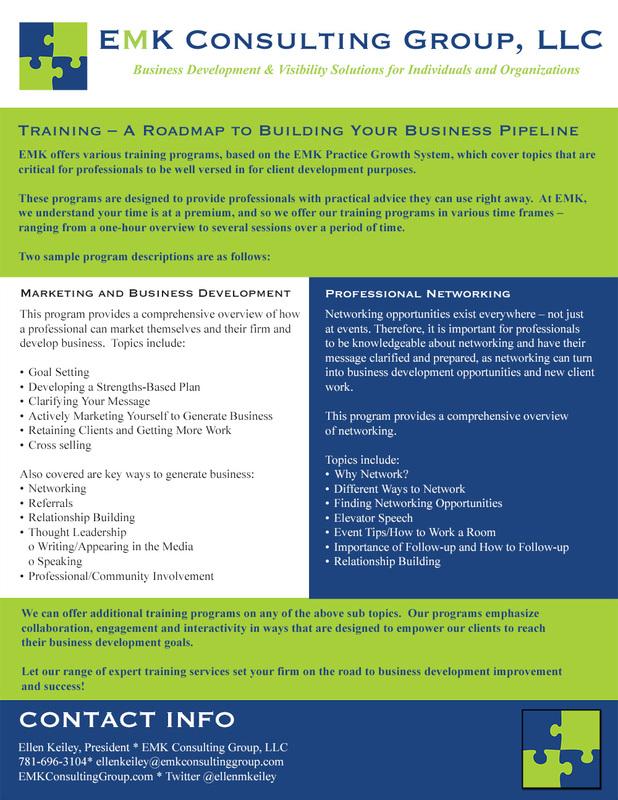 EMK offers various training programs based on the EMK Practice Growth System, which covers topics that are critical for professionals to be well versed in for client development purposes. These programs are designed to provide professionals with practical advice they can use right away. At EMK, we understand your time is at a premium, and so we offer our training programs in various time frames – ranging from a one-hour overview to several sessions over a period of time. Networking opportunities exist everywhere – not just at events. Therefore, it is important for professionals to be knowledgeable about networking and have their message clarified and prepared, as networking can turn into business development opportunities and new client work. We can offer additional training programs on any of the above sub topics. Our programs emphasize collaboration, engagement and interactivity in ways that are designed to empower our clients to reach their business development goals. Let our range of expert training services set your firm on the road to business development improvement and success!